For longer than 30 years, Laurence Aberhart has been providing an insight into memorializing war with his images of single Anzac figures and monuments. 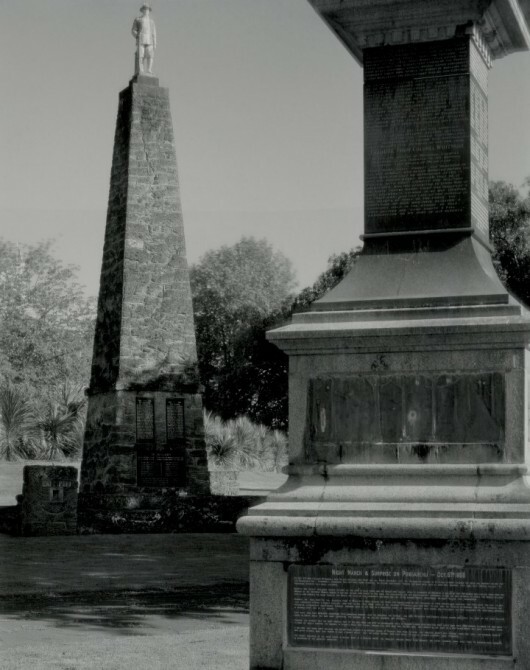 He's travelled throughout New Zealand and Australia capturing the striking images, and now you can see 60 of these prints in the exhibition ANZAC: Photographs by Laurence Aberhart at Auckland Art Gallery Toi o Tamaki from May 30 to December 6, 2015. We talked to Aberhart about the process behind his work and what initiated this three-decade project. D-Photo: More than 30 years of work has gone into this exhibition; what is it like to now see it exhibited as a whole? Laurence Aberhart: I do not see this as a whole. It is part of the greater range of ‘work’ that I do. I collect things in photographs. This could be seen as a subset of a subset. It is not complete as I am not a complete-ist. But it is good to see a collected group, together, on the wall and in print, to be able to read the greater picture rather than the singular. Then, one is able to see the ebb and flow of it. It is the justification for all that effort. How did taking photographs for this project begin? What triggered it? I use a big camera on a tripod. The larger format, to a degree, determines certain work practices — long exposures being one. I self-taught myself photography and the history of photography. I developed an attraction to nineteenth century images — the older the better in my book. The first photographers, because of the low sensitivity of their materials, made very long exposures, so many of the first photographic images are of statuary, immobile representations of the human likeness. I would like to think that in following on with the same, that I am not copying but participating in the ongoing history of the documentation of ‘memorials’, and participating in the unbroken practice of what I can only call, ‘the ritual of photography’. What was the process behind deciding which camera to use? I have used the same camera since 1974/5 and nothing but that camera since 1979. Were there many difficulties in shooting with available light? If so, how did you overcome them? Wind. Other than that, set camera up on tripod, determine and set the aperture, trip the shutter and let it go. You travelled across Australia and New Zealand to capture these images — how did you know where to go, did you have a path in mind? Much of the earlier work was serendipity. It was what I came across in my travels up and down New Zealand and, more lately, in Australia. As the centenary of WWI came closer I realized that I had better focus more intently on the WWI soldier memorials, I had to plan circuits. Some memorials I already knew of, and would have noted before, and some was research on various websites. As the work has been essentially self-funded, with some assistance from Creative NZ towards the end, it has been made under a degree of economic restraint. You could go on, not forever, but for a very long time, to finish this. And as I have said, I am not a complete-ist. What sort of messages are you hoping people take away from the exhibition? I don’t think it is for myself to have any sort of message. I would hope that the work, as images, is open enough for it to trigger whatever the viewer wants to get from it. This is a travelling exhibition and was launched in Dunedin. What do you think about it travelling the country? Do you want to see it shown in Australia as well? I think that it is a good thing that it is travelling to both large and small museums and art galleries, as there is something in it for every province and some states, and much of subject material local people would not be aware of. It was very important to me the honour the ‘A' of Anzac; not to make it solely of New Zealand images, so, yes it would be nice to see it go to Australia. A portion of it will be exhibited in Istanbul later this year [in an Australian exhibition].